Bairo Pite Clinic (BPC) is an NGO health clinic, located in Dili, the capital of East Timor (now Timor-Leste), that provides free health care services to those in need. Prior to the Popular Consultation in 1999 when the East Timorese chose independence, it was run as a military clinic by the Indonesian government and was abandoned when Indonesian forces withdrew from Timor-Leste in 1999. Originally, the clinic was set up to serve the immediate needs of a population affected by a humanitarian crisis. As the violence has subsided, BPC has adapted and transformed from an emergency medical service to a more comprehensive community health service. Today BPC remains one of the most highly visited health clinics in the country, seeing an average of 300 patients per day served by thirty-two Timorese staff and three permanent international volunteers. Bairo Pite Clinic’s vision is ‘Mai servisu hamutuk iha Timor Leste hodi foti saude communidade nian.’ This literally translates to mean: “Come work together in Timor-Leste to develop our community's health”. This vision has been put into practice through capacity building of local Timorese and through the training of many international medical students who come to learn at BPC. The success of BPC is based on both its ability to acknowledge and adapt to the changing health needs of Timor Leste and a genuine commitment to the Timorese people that began in a time of crisis. 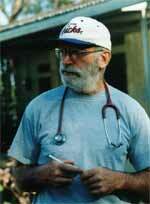 Dr Daniel Murphy, the BPC Director and Doctor, first visited Timor-Leste in 1998. During this time he was confronted with the lack of medical services available in Timor-Leste. In response Dr. Murphy began providing medical services, during that time he was the only non-Indonesian doctor working in Timor-Leste. “The fall of Suharto in 1998 opened a small crack in the door for the Timorese people. On my first night in Dili the clandestine movement made contact. Never looking back I spent two weeks traveling around the country as military roadblocks allowed meeting with small groups and evaluating alternatives for meaningful work. Settling on the Motael Clinic, I began my medical mission in earnest. Killing, torture and massacres were a steady weekly diet, as was a never ending flow of media attention. The politics at both local and international level progressively reached a feverish pitch. My hands were always in the gaping wounds of suffering. Visiting Sister Lourdes (Mana Lou) for the first time led to an immediate and long term trusting relationship. After the Liquica massacre she left me flabbergasted as she declared that she felt moved to go there to attend to those in need. The place was a virtual concentration camp at the time and everyone without exception wished they were anywhere but there. Then the steady stream of carefully sealed messages sent by this courageous woman to me so that I could inform the international media on what dastardly acts were taking place, left no doubt in my mind that her spirit was one of a kind. When asked if he had been involved with any political activities that have led to his deportation by Indonesian authorities Dr Dan Murphy replied “We take care of anyone that comes to our clinic. They could be on any side of this struggle, even military people. We’ve seen all different kinds. But they could see that as political, because basically we’re taking care of their victims.” (7:30 Report, August 5 1999). On his return to Timor-Leste Dr Murphy established Bairo Pite Clinic. After being abandoned BPC was re-established as a community health clinic. Following the withdrawal of the Indonesia militia the health service in Timor-Leste was in ruins. A survey conducted in January 2000 found that 35 percent of all health facilities had been destroyed, with only 23 percent of buildings escaping major damage (Tulloch et al 2003: 7). Supplies had been looted and equipment damaged beyond use. The majority of doctors and health management staff had left and the central health administration had been destroyed. It is in this context that BPC was established.